There were two openings side by side at the Los Angeles Brewery artist colony last Sunday. I was invited by Carla Viparelli to the first one, where she was debuting new artwork which stressed an unlikely historical harmony. She did so by creating a representation of Western antiquity through the visualization of broken archaeological ceramic shards with the preciousness of the contemporary refugee crisis in Europe. It’s first interesting to note that she has expanded her experimentation in space with fragmented compositions from before, and is now actually deploying them beyond something merely aesthetic, toward something symbolic or gestural. And it’s clear to put the puzzle pieces together what this gesture is once we recognize the refugee context. 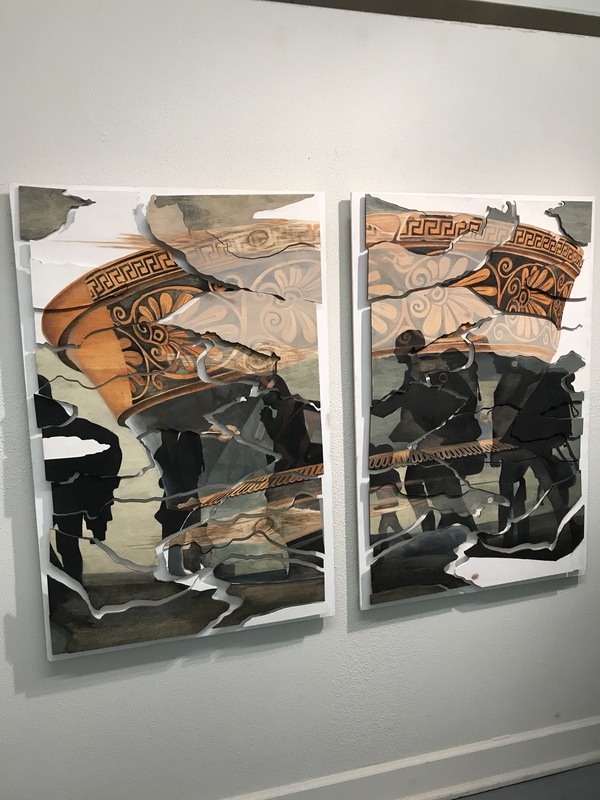 What is difficult to gather, however, is the relationship between the past with the present and why there is necessarily a connection between the two via broken artifact shards and an ode to Classical antiquity? But it requires a deeper historical understanding of the Mediterranean, that being a crossroads of a plethora of cultures and civilizations. Heterogeneity, in other words, has always been its fabric, and it is a bit synthetic to conjure an oversimplistic chronology of Ancient Greek to Ancient Roman lineage which preeminently owned the terrain. It is this effect which is the most difficult to impress with this idea, and if sympathy can be felt with the longing of the migrants’ hands outstretched, then Carla has accomplished her artistic aim. In doing so, she is humanizing the migrants. They are not pests but another form of humanity, who have equally set foot on Italian soil eons ago. She may not be championing residency, but at least civility toward their plight, which is laudatory amidst the political rhetorical carnage. At the Lamperouge Fine Arts Gallery, there was an incredible artist I discovered by the name of Francisco Alvarado. He had several poignant pieces which were striking in their choice of color and composition. El Grande for instance was able to showcase the artist’s use of blue. Reminiscent of Renoir’s piece Children at the Seashore at the Barnes Museum, the shades of blue depicted have a degree of monomaniacal obsession to them, but which appear to us as majestic in their impossibly incremental gradient. A deep Pacific Ocean blue is the only way to describe his manifestation, and it is helpful that he portrays the ocean to help with that context. A work of art which will go unnoticed but demonstrates an artistic master is his ASBS0116-3. This is avant-garde; radical in its minimalism. It poses the question of how bare can a work be with the most random elements, wherein assembled create a harmonious order we plainly can label as beautiful? Almost comically the work is held up with paper clips, signifying the Spartan devotion to minimalism. The geometries which appear are done so almost mathematically; there is no rhyme nor reason. Except out of a cast of characters one will naturally take the lead over the others, and in this instance, it is the black lines. They are thick, intentionally sculpted, to add texture but also as an anchor on the eyes to which the rest of the obscurities can gravitate around without being disruptive. Their action which gives a sense of momentum in the work is the secret ingredient to the minimalistic effort. The contrast with the plain white canvas helps the blackness appear crisp, focusing the eye with which the rest of the objects are supplemental, and incomprehensibly orchestrated in such a way that is not, again, jarring. The criticism with post-modern art and its serious abstractionism is that even an amateur can produce a similar style. But they cannot product a similar harmony, which is the result of years of toil that is the monopoly of the artist’s enterprise. Last to catch my eye was a piece titled Experimental Notation for the Sake of Improvisation by the artist Jewel Clay. The deeply stained wood panels presented an aesthetic work, rather than purely a task at radically challenging the spatial. This was further augmented by the silver leafed rectangles which encompassed the wood. These were intentionally choreographed to best use the reflectance of light, to give an aura of beautiful industrial design. This, beauty, though, is housed within an invisible boundary, which is imperceptible and can only be sensed intuitively; the work ends when the beauty fades into the obscure white wall. Clearly, this may be the most limiting reagent of the piece, that it requires a strong background to contrast its irradiance and meticulousness. Any other color has the fear of drowning it out. We would not be able to discern, for instance, the methodical sculpting of the wood, and their impeccable placement as if they were musical notes. And indeed musical notation is likely the plaything at hand. But instead of playing with a harmony of sound, the work plays with the harmony of light.